This is the Cathedral Parish of the Diocese of St. Mark the Evangelist, situated in the City of Polokwane, Limpopo Province, South Africa. Christ Church Cathedral strives to be a Church of excellence and resource to the Diocese of St. Mark the Evangelist providing kingdom ministry and sanctuary to the city through active participation of all parishioners. Christ Church Cathedral: in the city, for the city. We have begun holding only one combined service at 08h00 on Sundays as we cater for a reduced number of people in church. I provide the dates of these combined services below, and provide details of the Services for Christmas Midnight and Christmas Day. The Cathedral Office will close at lunch time on Thursday 20th December. It will reopen on Monday morning 07th January. The Clergy will be available for emergencies - note that both Dean Luke and Revd Thabang will be on leave for some of this time. However, our leave dates do not coincide, so one of us will always be available to assist. With the assistance of Khomotjo - our new Youth Worker, we have opened a You Tube account - search for Christ Church Cathedral Polokwane - into which we will be loading the Sunday Sermons. A number of sermons are already loaded and we will be loading all new sermons and slowly load earlier sermons. You can subscribe to this channel and You Tube will notify you every time a sermon is uploaded, or simply search using our account name Christ Church Cathedral Polokwane. We will be hosting a number of special events during 2019. We ran a very successful ALPHA Course in 2018. Thank you for all those involved in helping run the course, and for the participants. May God Almighty use you powerfully in your renewed Christian walk with him. We will shortly be communicating the dates and details of the next ALPHA Course for 2018. Watch this space! We have completed our Wednesday Evening Teaching for 2018. We will begin on the 06th February 2019. Details to follow early 2019. Thy Kingdom Come is an Global movement endorsed by Archbishop Thabo Makgoba, encouraging the church to pray for more people to come to know Jesus. It will be taking place between Ascension day and Pentecost (30 May -09 June 2019). Christ Church Cathedral will be hosting various activities over this period within the Church and Prayer Room. These will be announced shortly. 1. A Prayer Wall will be set up outside the church on which you can write your prayers on pieces of paper, tagging it onto the Prayer Wall. At the conclusion of the 10 Days we will collect the prayers and commit them to Jesus during the service. 2. Prayer Stations will be set up within the church for people to use as interactive prayer points. The focus being on the Lord's Prayer. 3. A Prayer Wave (or Vigil) is being arranged. The roster is already on the Notice Board, please fill in your name at an appropriate time slot for you. 4. The Prayer Room will be available throughout this time - and at every other time as well - for you to use for quiet and private meditation. The 5th Annual Golf Day took place on the 07th December 2018 at the Polokwane Country Club. The day was once again a wonderful success. Thank you for your support, it is greatly appreciated. A wonderful and spirit filled time was spent in Durban at this year's Anglicans' Ablaze. We are looking forward to the next one - tentatively planned for 2020. The photograph below shows some of the contingent from the Diocese of St. Mark the Evangelist. Please fill in a form that are at the back of the church to register yourself and your family so that we can update your particulars on the Parish Roll. Please note that it is very important to do this exercise. Fill out one form for each member of the family. Please do not hesitate to contact the office should you have any questions or concerns. Remember too that once you are registered on the system you can edit your own details online. 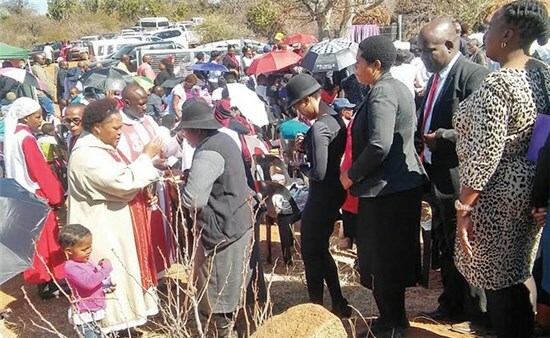 Over 5 000 congregants and members of the clergy of the Anglican Church of Southern Africa recently gathered at the grave of Manche Masemola in the deep rural parts of Ga-Marishane Village to commemorate and celebrate her life. Masemola is one of ten 20th century martyrs whose statues grace the Great West Door of Westminster Abbey in London. Koketso Masrishane, member of the Ga-Marishane congregation said the church’s Calendar of Saints marks the annual commemoration of the life and sainthood of Masemola on the first Sunday of February. Elaborating on the background of the event, Marishane stated that Anglicans began to visit the gravesite from as early 1935. Masemola, a teenager at the time of her death on 2 February 1928, was murdered by her parents for going against their will and preparing to be baptised in the Anglican Church. She was declared a martyr within ten years of her death. Her mother converted to Christianity in 1969 and was baptised. “In Westminster Abbey a structure dating to at least the 15th century with ten empty niches set among sculptures of saints and allegorical figures like Mary, Truth, Righteousness and Peace, was designated to honour martyrs of the 20th century. So far, only two Africans are recognised and acknowledged there, Masemola and Janani Luwum, Archbishop of the Church of Uganda.